Is There a Real Alternative to Windows? - Ask Leo! Only Windows is Windows. There are alternatives, but whether they're right for you depends on you. That’s a question I received not long ago. Particularly given the publicity around some of the issues with Windows 10 and its updates, I think many frustrated users are wondering if there isn’t something else they could or should be using. There are three major alternatives to Windows: Mac OS X, Linux, and Chrome. Whether or not any of them would work for you depends entirely on how you use your computer. Less common alternatives include the mobile devices you may already be using. Any alternative demands time and effort spent learning how to use it. There is no exact replacement for Microsoft Windows. Whether any alternative will work for you depends on that alternative’s characteristics as compared to your needs. The most commonly considered alternatives include Apple’s OS X on Macs, Linux, and the Google Chrome operating system. They each have significant pitfalls, depending on what you expect. OS X runs (legally1) only on Apple hardware, so switching means getting a new computer. It also means learning the nuances of OS X’s interface (just as you learned the nuances of Windows). It also means replacing all the software you use, as OS X does not run Windows applications. You’ll need to get versions of the same software available on the Mac, like Microsoft Office, for example, or alternative applications that serve the same need, such as LibreOffice or Open Office. Linux is free and runs on almost any PC, even an old one collecting dust in a closet. There are a confusing number of distributions to choose from, with Ubuntu and Mint being the most popular for Windows expats. 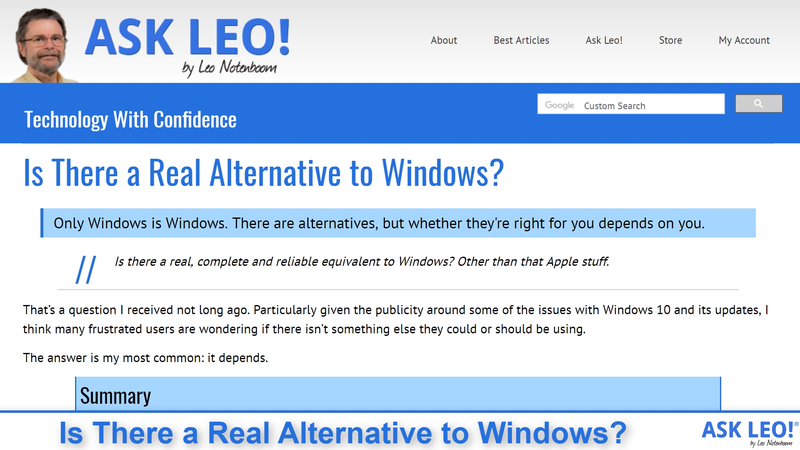 Like OS X, Linux does not run Windows applications2, so you’ll be looking for alternatives. Unfortunately, true Linux versions of Windows applications are very rare. You’ll need to find alternative applications that serve the same needs to your satisfaction. Google Chrome OS is available only on “Chromebooks” — laptops specifically designed to run the Chrome OS — so you’ll be getting a new machine to go this route. Once again, Chrome OS does not run Windows software, so you’ll be looking for alternatives. The good news here is that many Chromebooks can also run Android applications, where there often are official versions of Windows applications. These versions are often stripped-down equivalents to those you might find on Windows, but again, depending on your needs, they may be enough. That phrase “depending on your needs” keeps coming up. That’s simply because different people have different needs and expectations, and all of the alternatives have different pros and cons when compared to those needs. If you need the power of a real, popular, operating system with a corporation standing behind it to update and support it, and with numerous familiar applications that can do just about anything, a Mac might be the only real alternative for you. If you just need to put something else on your existing hardware, and are willing to take the time to look for and learn about alternatives for the applications you’re used to running on Windows, then Linux could be a choice. Note that online help for Linux runs that gamut from non-existent to somewhat helpful to downright belligerent at times, so be sure to pack a fair amount of patience. Unfortunately, there’s a reason Linux is still considered an OS for geeks (albeit a good one)3. If all you do is browse the web and send email, with a few other light tasks occasionally, it’s very possible a Chromebook might be right up your alley. There’s a strong argument for it being more secure than the alternatives above. Just don’t expect to do any heavy tasks like photo or video editing. And in all cases, be prepared to learn. In fact, be prepared to spend a lot of time learning, and in turn learning a lot. Each of these operating systems is similar-to-yet-different-from Windows. They each have the same concepts — files, menus, apps, browsers, and so on — but the specifics of how you interact with each is often different. It will take some time to get used to a different way of doing things. Interestingly, particularly among the younger crowd, there’s a move to rely solely on mobile devices like your phone, Android or iPhone, or tablet, such as an iPad. I know several folks who’ve switched to devices like these almost exclusively. Once again, it all depends on how you use your technology and what you want to accomplish with it. Mobile devices are great for many things, but not everything. Depending on your mix of activities, you may find you can go completely mobile only, use a mobile 90% of the time with that old Windows computer in the basement for times when a phone just won’t do, or realize that yes, you really do need a “real” computer to meet your needs. Finally, I have to add that every alternative could give you a case of exchanging one set of problems for another. I know many people who are Apple- or Google-averse for privacy and control reasons. My experience with Linux is that it’s rare a day goes by without some kind of update to install. None of the alternatives are frustration-free. Depending on your reasons for looking, be sure to examine the alternatives you’re considering to make sure you don’t end up with something that frustrates you even more than what you’re trying to escape. How Do I Switch to Linux? - Changing a Windows XP operating system to a Linux platform is not a simple upgrade or migration. It's more like starting over. Here are the basic steps. 1: There is a project called Hackintosh, but as its name implies, it’s more than a tad geeky, and certainly not supported by Apple. 2: You’ll hear references to something called “WINE” to run Windows applications on certain Linux platforms. Again, geeky, and in my experience, the resulting performance of the applications that work leaves much to be desired. 3: Indeed, if I didn’t do what I do for a living, there’s a real possibility I’d be running Debian Linux on my primary machine. If you’re anywhere near being a computer geek or hobbyist, it’s worth playing with. I did an experiment and installed Linux Mint on my work computer. I teach in a college and we use an online learning platform which works on any browser. I also used Libre Office extensively (It did everything I would have done in MS Office), edited pictures in Gimp which I also use in Windows. I also played and edited media files. I used this for about a year but the deal breaker was OneDrive. I use OneDrive (1 TB per machine free with Office 365) as my NAS to keep all of my computers’ data in sync. I was able to work around this by using Dropbox which gives me 23 GB storage. When that wasn’t enough, I switched back to Window on that machine. As for the learning curve, I’ve found that it’s just about as easy or even easier to go from XP to Mint than XP to Windows 7. That’s not only based on personal experience but the experience of friends who had older computers I installed Mint on. I agree with Mark that going from XP (or Windows 7, in my opinion) to Linux Mint is as easy as or easier than going from XP to Windows 7… likewise, when going from Windows 7 to Windows 10. As is the case with many authors who write about Windows users thinking of trying Linux, the “learning curve” is rightly mentioned. My concern is that some authors overstate both the volume and the level of difficulty of learning to operate a Linux system. For computer users who use their devices to visit websites, send and receive Email, enjoy social media, online shopping, etc., there’s just not that much for those accustomed to Windows to learn about Linux. I suspect that learning the details of what’s “under the hood” of Linux would, indeed, be a load to learn, but I also suspect that most computer users don’t care whether there’s a magic being or a chipmunk “under the hood”. Many, I believe, want only for their computer to work and do what they ask/demand of it. As for frequent Linux updates, most take less than 5 minutes and many less than 2 minutes to complete. I have never had a problem caused by a Linux update. Plus, the need to re-boot after an update is a rare exception rather than the usual. I use Onedrive from Linux, via the web interface. It’s not as convenient as Dropbox, but it works. IMHO, the first thing a person moving to Linux needs to know is that Desktop and desktop are completely different places. My desktop system runs Xubuntu, my file server runs Mint Mate, my laptop uses Mint Cinnamon. All of them are at least eight years old, and perform quit nicely. I support Windows 10 users, and the updates make me crazy. I have already found the alternative for Windows 10, after 2 years of frustration I scrapped Windows 10 completely and bought a MacBook. My only regret is that I ever used Windows in the first place. Although I did like Windows 7 and would have stayed with it forever if they would keep supporting it. Which they won’t. But mainly I am free from the Windows arrogance of take it or leave it, we know what’s best for you. I left it and won’t be back. Good riddance. I’d switch to Mac in a New York minute if it wasn’t for the overpriced hardware. Beyond that, I haven’t had any real issues with Win 10. Yet. Knock on wood. A New York minute? Isn’t that about 15 years? lqtm. I too had issues going from XP to 7… but when I got a Win10 serial (legally from a demo’d pc) and it was installed for me on a newly cleaned machine it was amazingly easy to find and use most stuff. Which really surprised me because when I’d played around with it in the shops shortly after it launched it drove me nuts. Nothing seem logical then. Perhaps because some stuff was locked down, maybe partly because of sales flunkies looking over my shoulder. My sentiments exactly! My philosophy is no Apple none of the time. One advantage to most Linux OS’, that I believe can be very helpful, is the ability to download a Live version of the one you might be interested in. This way you can run what ever version of Linux you choose without installing it on your computer. Hope this will be helpful if you want to try Linux. Indeed. I’ve tried numerous versions and probably the best has been Linux Lite. Very Windows like in the way it approaches a lot of things. Biggest downside is the megafugly wallpaper that it defaults to. Maybe they’ve changed it, been a while since I’ve had a look and play with a later version. A major upside is the relatively few viruses that attack it. Partly because Windows is a bigger user base and inherently less secure historically. One of the reasons Mickeysoft now force update downloads. Wallpaper a downside? Changing the wallpaper is very easy. Just find a photo you like or a website which offers free wallpapers and install one of those. There is a alternative to Windows that is windows but its not quite ready for prime time but with some funding it will make it to Beta. Its called ReactOS and information can be found at https://reactos.org/ as well as a download link for the latest alpha release. …and which has been in development for what… about 10 years? Certainly seems like it. Never even looked at it… wasn’t prepared to have my, at the time, one and only pc go belly up if the worst came to worst. I’ve been watching ReactOS for years, having done trial installatins along the way. I’ve been impressed with their development, very slow progress in the beginning, and now faster with better funding. I’m hoping it hits the market soon, and that the WinXP themes become a little more modern. I won’t jump ship and go to it immediantely, but I’ve sent them small donations a couple times. In the meantime, Linux Mint is my go-to OS. It has never let me down, never had a ‘bad’ update, never had a virus/malware, or had a file extension I couldn’t read, never had an update forced on me, and updates are a breeze, installing on old hardware usually within 2 minutes, at a time of my choosing. When M$ crashed my wife’s Win7 machine, she asked me to let her try Mint. She’s never looked back. There was so slight a learning curve–it’s just like Win7. Even when we upgraded her hardware, she specified she only wanted Mint. I’ve offered to install Office 2010 on her machine (using Play-On-Linux– I’ve done it). She declined in favour of LibreOffice. Now add in the cost of Mint–$0, it’s a no brainer. I buy the hardware, and only I control it. M$ wants me to buy the hardware so they can dictate who controls it. Same with Apple. No thanks! I enjoy the freedom from $$ dictators. Hi Dave: Thanx for the very helpful assessment of Linux Mint. Have you found any Win apps for which there are no corresponding Linux equivalents ? If so how did you handle ? I’ve dabbled with Linux over the last 20+ years (Live CDs, dual boot, VMs and dedicated installs with various distos ). One of my bigger problems has been the traditional problem of getting drivers to work with the hardware. Two recent examples: failing to get the touch pad on a Toshiba Satellite to work. Failing to automatically re-establish a Wi-Fi or hardwired network connection on restart. That being said, hardware compatibility is much less of an issue these days than it used to be. So much as I would like to leave MS-Windows behind, there continue to be enough issues that make it difficult to commit, or even recommend it to users with moderate computing requirements. However, if one day MS-Windows were simply not available I would get by using a Linux disto and the vast selection of open source software. Fundamentally you can probably do more in Linux than you can in Windows, but inevitably you need to master the command line & scripts. Conversely the GUI is more powerful, more coherent and better used in Windows software. Don’t forget Intel Mac’s can run Windows 10 as well as OSX…and Macs do it well in either a virtual machine or a dual boot. I run Windows 10 in a Parallels virtual machine on my Macs; with dual monitors switching back and forth in seconds, and can even share my apps from either one on the others desktop, if in Mac, the Windows app icon shows on the Mac desktop and vice versa. Click the Windows app icon, and it just shifts screens to the Windows 10 side. Seamless and Windows 10 runs faster and smoother on both my Macbook Pro, and my iMac than it runs on my school system supplied HP laptop. PCMatic on a scan rates my Windows 10 install in the fastest 25% of all Windows in the world. And neither of my two Macs are anywhere near the most powerful Macs. To be accurate, I do have a 3rd Mac. 2011 Macbook, bought used from the school system after 4 years use there, it runs the latest Mojave OS from 2019, it will run the Parallels virtual just like my two newer machines , 25% slower, but still completely useable, the case is looking kind of beat up, but using Time Machine backup, I keep software and data current with the two newer machines every couple of weeks in case I might need it. Takes about an hour. Didn’t see any comments by Chromebook users. I have had one for about a year, and to borrow a phrase, “it just works”. I keep a mini thumb drive plugged in for local storage and have to send print jobs to my windows 8 computer. It does everything I need with ZERO time spent on maintenance. Why do you have to send print jobs to your Windows 8 computer? If only, and maybe they do, make a chromebook that could load on a computer, rather than a cut down laptop. I need a real ergonomic keyboard, storage capacity and minimum screen size of 22″ diagonal. I’ve never used a Chromebook, but don’t they work withUSB keyboards and mice, and external monitors? Paul, I’ve been using an Acer Chromebox for almost 3 years I think. I use the wireless keyboard and mouse of my choice, and I have a pair of 27″ monitors for a very large desktop display. I am a longtime IT support engineer with experience going back to the old DOS days running off floppy disks, Novell file servers, Sun Spark computers, as well as HP-UX, IBM Unix, Linux in many flavors. For my desktop, I can turn off my Chromebox, and when I turn it on, it’s there. Seems like every time I shut down a Windows PC, it needs to install more updates. Or it just installs the updates on its own because I forgot to turn off auto-update. As for storage, I have a pair of 3 TB NAS drives on my local network, and they are fully accessible from the Chromebox, as well as any other systems in my house. I haven’t upgraded my home printer to one that will support Chrome directly, so like Dean, I print through a Windows PC that makes the printer accessible through Chrome. I do run some proprietary applications like QuickBooks Pro, my annual tax software, and some investment software that only runs on Windows, but I’ve recently been moving those applications to a virtual machine in the Microsoft Azure and Amazon AWS clouds. I can run an Android based app on the Chromebox to access Windows hosts, locally or a cloud based host. With Amazon and Azure, my host systems are backed up, and I can easily move between higher processor power and RAM as needed without having to rebuild a system from scratch. I live in an area with high electric rates, so the cost of the cloud based hosts for my limited applications doesn’t cost much more than the electricity of running a high end system at home 24 hours a day. I strongly encourage users who don’t really need more than browser functionality to consider Chrome. It is also easy to boot from a USB stick, so people can try it from their existing PC hardware without having to commit to a new box. Windows – in its various version – continues to be a successful operating system because it works well for most people virtually all of the time. The questions about alternatives may come from a frustration around an update, but more frequently it sounds like Microsoft is the company people love to hate and to rant about. My experience is that much like asutomobile brands, all of the platforms have their issues. The issues just differ between brands. Over the last year, I have had several software problems with my two Apple OS devices – including regularly needing to shut down to install updates and clear problems. That hasn’t happened once with any of my three Win10 devices. My NAS with a Linux based OS – biweekly reboots required. I seldom use my Ubuntu/Linux box for all the reasons Leo mentions. (1) Stay with well supported hardware from reliable brands. That fabulous add-on product you got from a Hong Kong vendor 4 years ago – produced by a company that disappeared 5 years ago – will give you problems on any OS – and it is not the OS’s fault. (2) Stay with your existing OS if it supports 98% of what you need. The personal cost of a change (in business settings this is the personnel retraining cost) will never be recouped with a ‘better’ OS. You will spend time learning how to deal with that OS’s issues. My NAS has been running for years with no updates. It runs 24/7 for months at a time, except when a power failure shuts it down. I’ve used it for well over 5 years without fail. No malware of viruses. But I use BSD powered NAS4Free. You might want to look into it. Long time subscriber/reader here; rare for me to reply to anything, though. Your article is excellent. I’m replying here particularly to the Linux portion of your above piece. I have some information that may be of some further assistance to those considering Linux as a replacement for their MS Windows or Apple OS. The info is in the form of a link to my Nocturnal Slacker v1.0 blog (at WordPress). It’s an article I wrote a few years ago to try and help folks making that transition from MS Win to Linux. It’s a bit dated and there are probably some dead links in the article, but it still has some worthwhile information in it. Note: my blog is not monetized (I don’t earn $$$ from it) by me. The ads are 100% WordPress. They are not in-your-face about it, but they are trying to make a $. That’s OK, I s’pose. Anyway, all content on my blog is free to read. I also recommend that anyone who actually follows the link below to my article click the links to other informative tidbits within the article; which, by the way, is called The GNU/Linux Adventurer’s Backpack. Thanks for all the years of extremely useful information from Ask Leo! Hi Eric: I give up – what is a “Nocturnal Slacker” ? The Slacker looks like a homage to Slackware Linux and nocturnal probably refers to night-time blogging. Meh… that’s close. Slacker is a nick for Slackware users. The Nocturnal part is descriptive of my sleep habits. For most of my adult life I was quite nocturnal; so much so that it was also my nick in the biker clubs I’ve ridden in over the years. After a short stint in the hospital in 2010, I awakened to the possibility of living a diurnal lifestyle. I discovered mornings without having to stay up all night to see them. I’ve been a “morning” person ever since then. I second most of what John O’Meara said about Microsoft and Windows. I’ve used computers of one sort of another since the early sixties and I’ve used Microsoft products since their first public offerings. Apple computers didn’t light my fire and neither does Linux. I have had an occasional, small problem with Windows but I have never suffered any problem of consequence. I read all the industry “stuff”, from Information Week down to Windows Secrets on a daily basis and I have seen all the attempts to get me and others to hate Microsoft. One day it was for too few updates and the next for too many updates. I see claims about all the damage done but I have to be the luckiest guy on earth, I was never damaged by the world wide catastrophes that did so much damage to others. I don’t question that some people have had problems but I do question how many of those problem were self imposed by people employing bad habits, sub-standard hardware and poorly designed applications. I guess that if I were going to leave Windows I would opt for Apple but I’ll never do it because I don’t want to give up control of my environment to their designers. I believe that Windows updates can brick (make useless) some computers. You just happen to be one of the lucky 99%+ users who don’t have problems :-). Seriously, Ask Leo! has thousands of readers and compared to that number we get very few complaints about a computer bricked by a Windows backup. I should have mentioned that I still have Win 7 on a separate hard drive. My wife uses it for Adobe Photoshop and printing etc. It keeps chugging along but never on line. The Epson Artisan works better with Windows. I had Windows 10, but it was so bad that my computer guy switched me back to 7. Now, the new thing with Microsoft is that they are using updates to old systems to totally mess up your computer, thereby trying to force you to use 10. My computer guy had to turn off ALL updates so I could continue to use my computer. I am a retired senior on low SS income and also a computer moron. There should be SOME regulation of Microsoft to protect the people. Linux, running in a VM would have a very small chance of being affected by what is happening in Windows. For example, if you used Linux for your online banking, a Windows hack wouldn’t be able to get in and grab data from the Linux inside the VM. My reaction to Windows 10’s bricking my motherboard when I tried to “upgrade” in 2015 is cold fury. I managed to restore Windows 7 by replacing the murdered Foxconn motherboard with an Asus, which was a huge problem because of the low-level drivers the CPU needs to communicate with the motherboard. I plan to switch to Linux Mint, but replicating the tools I’ve piled into my W7 machine will be a huge pain in the tush. If you understand those two things, you can try Linux. Computers are now cheap enough that I can use a separate computer Windows computer for CAD and a Linux computer for web and everything else. CAD has me locked into Windows. GNU/Linux online help can be very helpful. I use NixOS and when I had a question and asked it they were very helpful and not belligerent at all. I also found this great helpful attitude in the nmh (i.e. mail application that I use) mailing list. linuxquestions.org is another site that is good for friendly helpful GNU/Linux advice. However I do tend to struggle with my problems for a many hours before I ask a question. People in the GNU/Linux community will help you for free in their own spare time but they will often expect you to at least do some homework. This is only reasonable since they do not get paid anything for helping you. If your problem is not worth x of your hours to you then it is often not worth x of their hours to them. GNU/Linux has great customisability and almost everything on it is both open source and free. None of the other alternatives to GNU/Linux beat GNU/Linux on this. I switched my Dell Laptops to Linux Ubuntu OS last year and have not had any problems as I had with Windows 10. I use Libre Office which works similar to the old MS Word programs. I still have Windows7 on my old Dell Desktop. I use it now and then to access a program then transfer the info I need to a thumb drive and open it on the Linux OS. As for backups on the Dell Laptops with Linux OS, I use a 2TB external USB storage which backs up all of my computer daily. I also copy important files and folders to it manually, just in case, then with a bit of a workaround I can upload my important files and folders to my online Sync,com storage site. I have lost faith in thumb drive storage devices. I have had many go corrupt in a short time. I have the Google Chrome compatible with Linux OS loaded which will play videos. Also I can access my Google Web album which stores my pics and videos automatically. I also have a Chrome Book tablet which is great for watching movies and sports events without background program interference. So I have found workable alternatives to MS Windows 10. Even my LG phone works to access most of the online sites I use without the MS Windows interference and background Malware programs gobbling up the bandwidth and memory. My recommendation is to try Linux OS and Chromebook. If it does all that you need it to do, dump MS Windows and get rid of the frustrations. Just to add an important point to selecting an other operating system like say Windows. 1) The providers help section was very bad and somebody like me who is a user and not an enthusiast or fast learner (85 years old) needs easily available and easy to understand help. As this was not available with Linux, it made it a no-no system for ordinary users. 2) There were no people locally to help. This in fact is the main drawback for Linux. Windows on the other hand, though not the best, is used by a lot of local people everywhere that can help. I am now back on Windows 10 and find it very nearly as easy to use as Linux was with plenty of local help. Linux is phasing out the “old computer gathering dust” option. Most distros no longer support 32 bit machines, and chrome browser 32 bit is outdated. I was glad to see Carl Kettler’s comments about using Chrome OS because for many people a Chromebook or Chromebox is all that is needed. I set up a Chromebook for my 90+ year old mom who had never used anything more complicated than a TV remote or flip phone, and she managed to successfully use email, which is all that she wanted. I also helped a friend move from an archaic Windows laptop to a Chromebook with Google Drive for file storage, and that is working quite well for her. The biggest challenge was printing and scanning, but I figured out how to use an HP LaserJet MFP M130fw for that. I used the HP Print for Chrome extension from the Google Chrome Web Store. I explained how I did this in an entry dated September 27, 2018 in the Support section for the HP Print for Chrome extension. I also want to comment on the option to use a mobile device such as an Android or Apple phone or tablet in place of a Windows computer. I have successfully paired a Bluetooth keyboard with a mobile device, which can make typing faster and more accurate. I have used a Google Chromecast for screen casting from my mobile device to a screen that has an HDMI port, which many newer PC monitors and TVs have. There are also other ways to do screen casting. I have not tried to pair a Bluetooth mouse with a mobile device, but I believe that can also be done. If you use a mobile device that can otherwise do everything that you need to do, then you could possibly have a reasonably functional configuration by using a Bluetooth keyboard plus screen casting and maybe a Bluetooth mouse. If you use an Android mobile device, then adding a Chromebook or Chromebox would be quite compatible and probably more functional. Microsoft is steadily moving Windows to a leasing model just like Adobe and Office 365. You can see it in the wording. Newer updates announce that Windows is a service. The idea, probably over the next five years is to change the perception of Windows to that of being a service that one leases. So just as leased Photoshop has resulted in a number of excellent Photoshop replacements coming onto the market with licenses that have a one time cost. Similarly a compatible Windows competitor maybe using some of Linux’s infrastructure is likely to come onto the market. I for one would happily pay a one time license fee to get away from MisFit, but until them I am stuck with their uncontrolled only partly tested updates. A recent Win 10 update broke VirtualBox on my machines. By the way your article should have mentioned VBox as a way of managing the OS mess. I’ve had a couple of people mention virtual box (and parallels on Mac) as an alternative. I tend not to consider it a practical alternative for most people, since it requires a fair amount of technical comfort. I’ll consider doing a separate article about it sometime in the future, though. Good article, I run a dual boot system, running Windows 10, with Ubuntu 18.04, I much prefer Ubuntu but as you say there are some programs that only run on windows, frustrating! If your just using your PC for email and browsing, occasion letter writing, you can’t beat a linx system, the free office software is brilliant and compatible with Microsoft office, there’s also some great photo editing software, that are nearly as good as Photoshop all for free, plus numerous other programs to suit your requirements. It is a different system and you will be frustrated should you try it, but plenty of tutorials on YouTube! Hi Leo. The only “Real” complaint about Windows I have, is I heard Microsoft plans to move to a subscription based product, like many other vendors that I use (Like Quicken) or have used it’s a real reason to look for a alternative. Why should I fork out $100+ for software and then have to repay that amount annually? I’m a home user and it seems a bit much. It seems that that a new, wide sweeping business model has emerged, and it’s corporate greed. You’re worrying about nothing more than rumor. Nothing like that has been officially stated at all. Nothing. XP 64-bit for the win.